This recipe is so good, I’ve done it with many variants but my fav combo is this one! Curry happens to be my spice blend of choice for this recipe. You can use your imagination with the spice variants but this is a fabulous base. 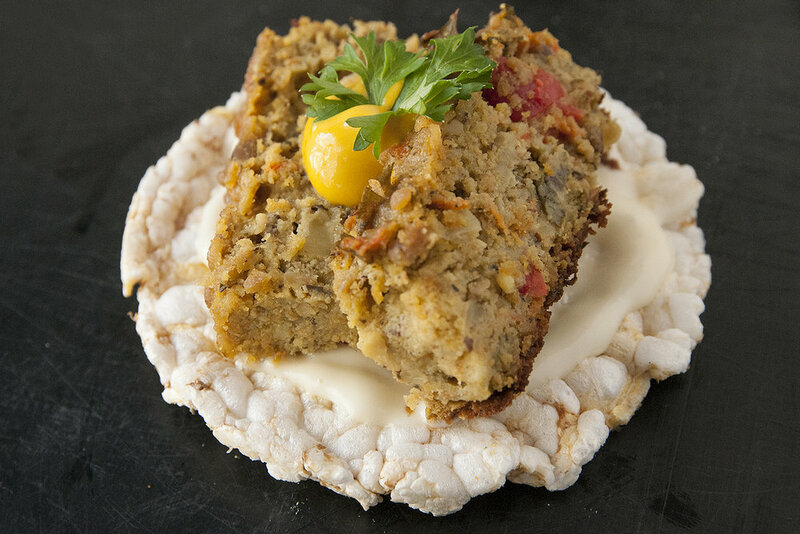 Nutritional yeast is also responsable for a lot of the flavour in this végépâté and it provides a lot of the B12 vegetariens and vegans need to balance out their diets. Grease your lasagna pan or a 9x9 inch pan with olive oil, and pour mixed ingredients in. Smooth out to create an even layer. Place in oven for an hour and check it out. A pâté is a spreadable thing so it’s normal if it's a bit wet inside but it should be firm and golden on the outside. Let cool completely and enjoy with your favorite bread or crackers. It is amazing with yellow mustard and home made mayo... with lettuce, in a sandwich... YUM! I’ve doubled the recipe if not more and added more veggies with success! Cook in two pans if doubling the recipe. Play around with other veggies and spices! Try ground dried mushrooms to add an earthy flavour. Or sun-dried tomatoes, or other root vegetables as the base... there are so many possibilities! Like this recipe, want more? CLICK HERE! Sign up for Karyn & Creative Compulsions' news • Receive updates, cool product promotions and anecdotes about Photography, Art, Crafting, Gardening, Cooking, Kids and more! ...I'll try to be funny.